A hub for international trade dating back to the 16th Century, Semarang is the capital city of Central Java. 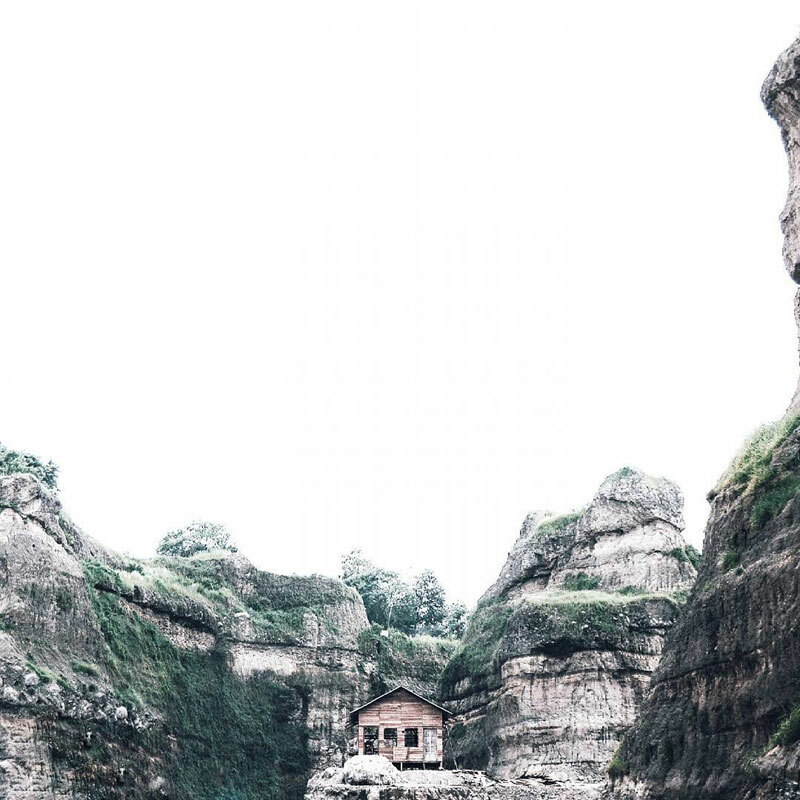 On the surface, it might not appear to be as attractive as neighbouring Yogyakarta, but if you spend a day or two, you’ll be sure to find its hidden charms! 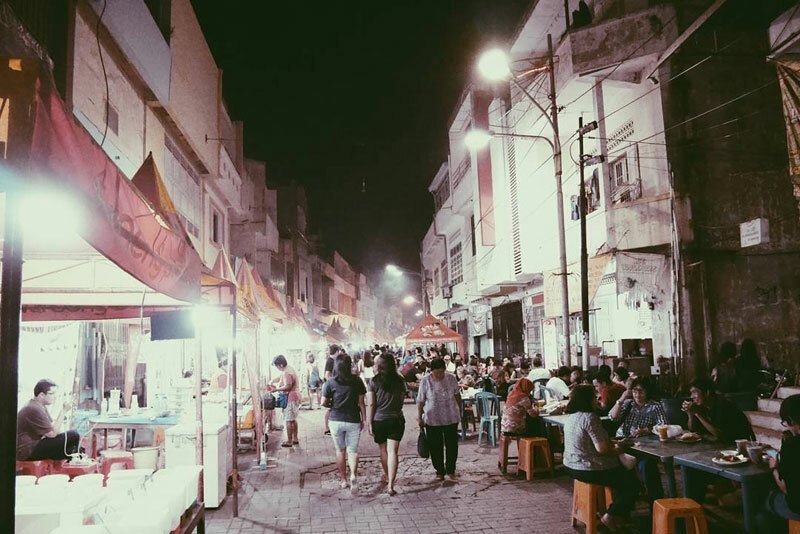 Influenced by cultures brought by Chinese and Dutch immigrants, Semarang is a melting pot where diversity is embraced, evident from the city’s grand architecture and mouthwatering cuisine. Semarang is essentially divided into two. The first is Semarang Bawah, the heart of the city where the action happens, and this is also home to Kota Lama (Old Town) where you can find colonial-era architecture. 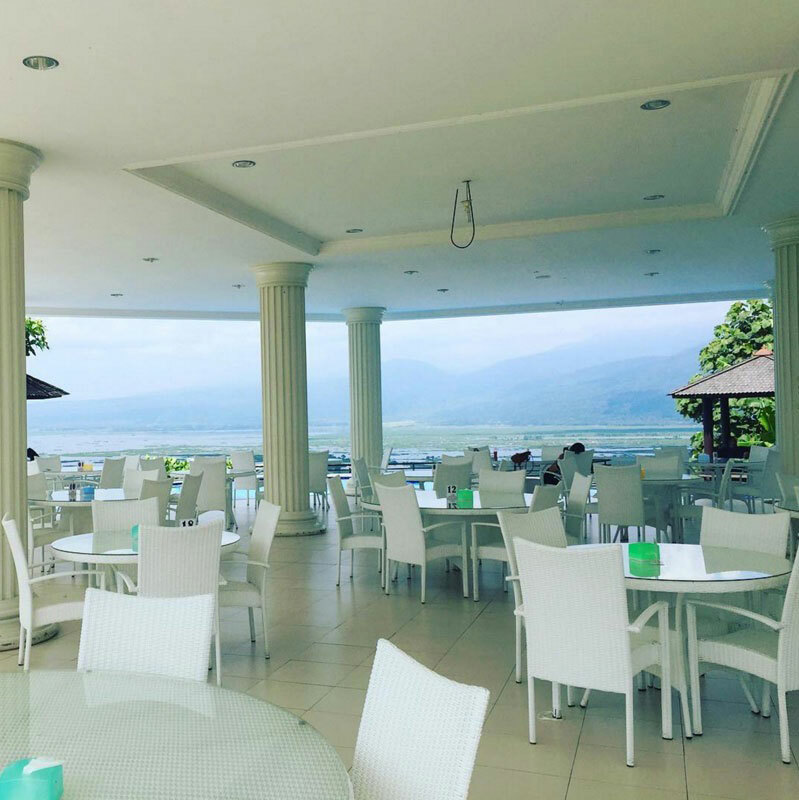 Semarang Atas is located south of the city centre, on the foothills of Mount Ungaran – so you can expect the weather to be cooler here (an excuse to escape the heat!). When is the best time to travel to Semarang? It’s typically hot and humid all year round, with the rainy season between October and March. We recommend travelling between May to September, when it’s generally sunny and great for sightseeing! Semarang also has an annual festival ‘Dugeran’, to welcome the fasting month of Ramadhan. a. By bus – The BRT Trans Semarang (IDR 3,500/ USD 0.26 per trip) is by far the least expensive mode of transportation in Semarang and the easiest to navigate, with its own app on android. They are fairly comfortable, but can become slightly unreliable in terms of time. Intercity buses can be easily identified by the ‘origin-destination’ label on the windshield, fares vary depending on distance. b. By taxi – There are several taxi operators to chose from. Blue Bird Taxis may be more expensive, but are the safest and most comfortable. Any other operator should be fine as long as you make sure the fare runs on the ‘argo’ (meter). c. Becak – Becaks are bicycle rickshaws that fit up to two people. For short distances, they are one of the cheapest ways of getting around. This story would not have been possible without the support of Indonesia Tourism Board. 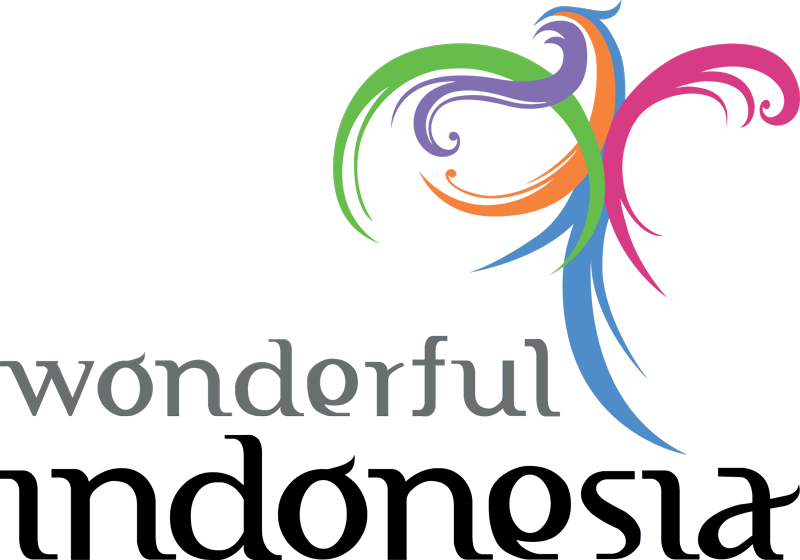 For more information, check out Semarang’s official website. Here’s where and why you should stop by Semarang on your next trip to Central Java! Looking for an exotic island getaway? Although a coastal city, the beaches you’ll find in Semarang are not exactly ‘sun, sand, and sea’. But if you travel 90 kilometres north, you will find a cluster of 27 islands just waiting to be explored, most of which are uninhabited! 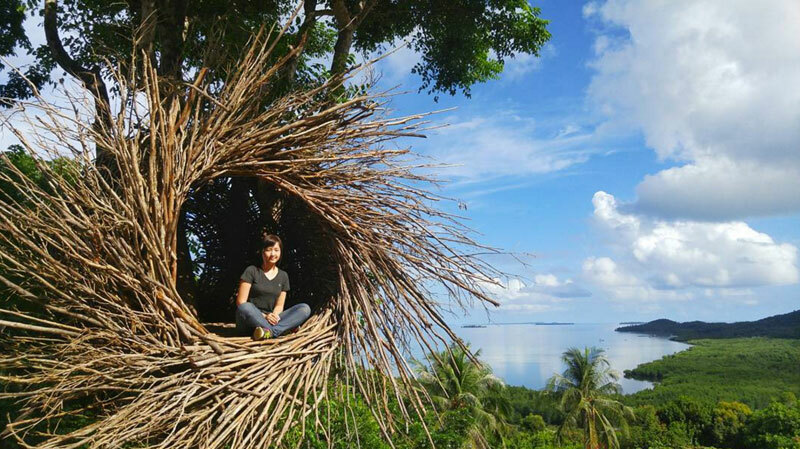 Far from the effects of fast-moving capitalism, a laid-back island life is preserved in Karimunjawa, with eateries serving home-cooked seafood dishes and homestays as common accommodation options on the main island. 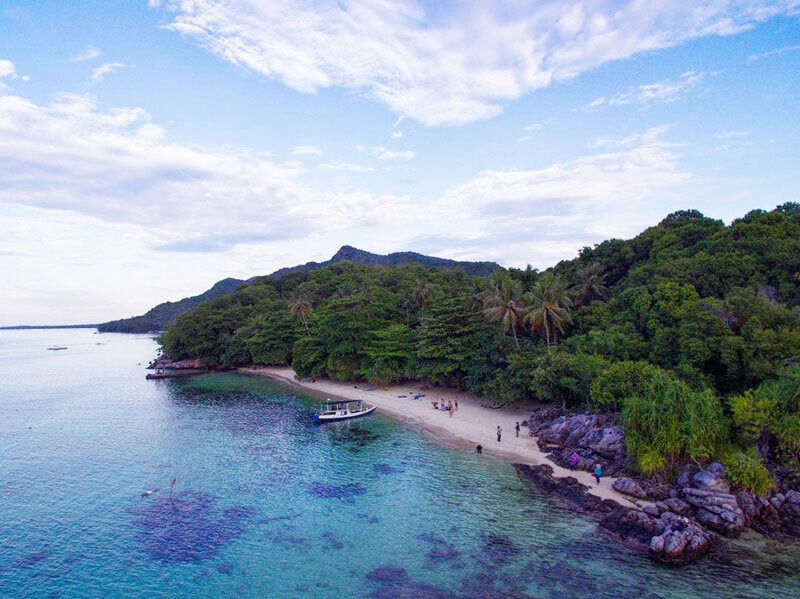 Initially a nature reserve, Karimunjawa boasts of a massive collection of marine flora and fauna, from a kaleidoscope of tropical fish among coral reefs to the birds that encircle above. 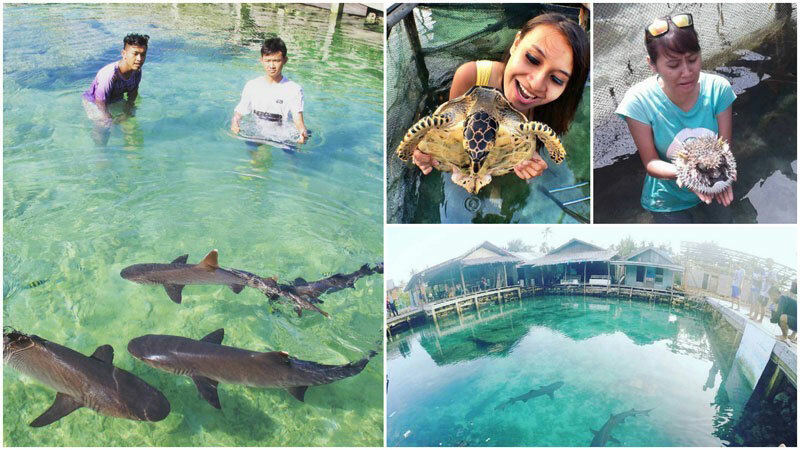 If you think you have seen it all, why not attempt swimming with sharks at Menjangan Besar Island? 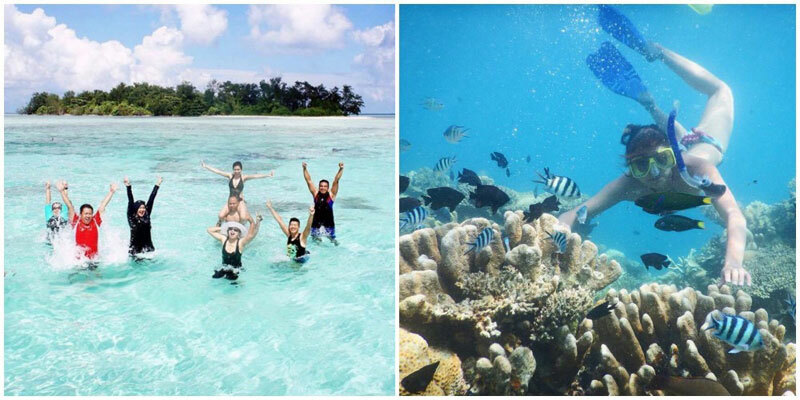 There’s more than just endless stretches of sandy beaches at Karimunjawa. 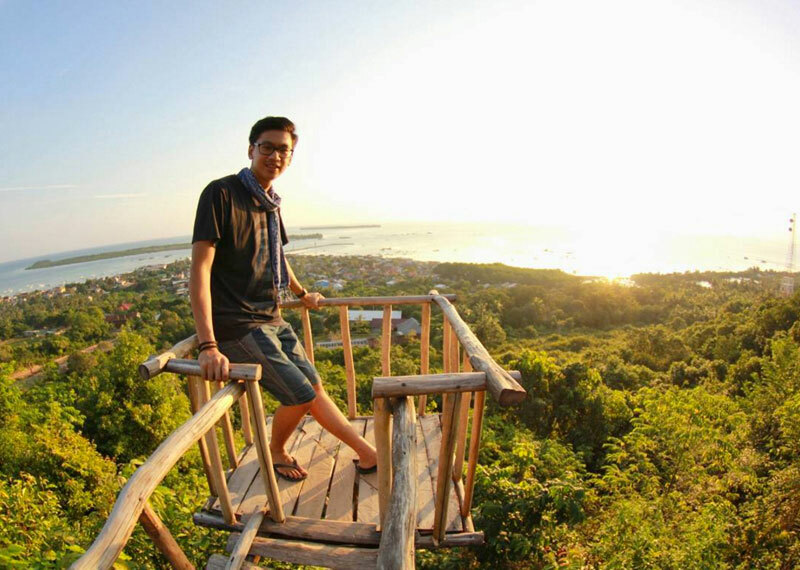 Bukit Joko Tuwo, the highest peak on the main island, provides a vantage point where you can get a panoramic view of the island – perfect for watching the sunrise too! And guess what, it’s also home to the remains of a prehistoric whale found on the islands! Ferries to Karimunjawa are very limited, and only two leave Semarang every month. You will have to travel to Jepara (3 hour’ drive) where the Express Bahari (speed boat) leaves every Monday, Tuesday, Friday and Saturday. The boat leaves at 9 am, so take the 5 am bus which costs IDR 15,000 (USD 1.12) per person. Take a 10-minute becak (trishaw) ride from the terminal to the harbour. Do not forget to arrange your trip back before leaving the harbour. 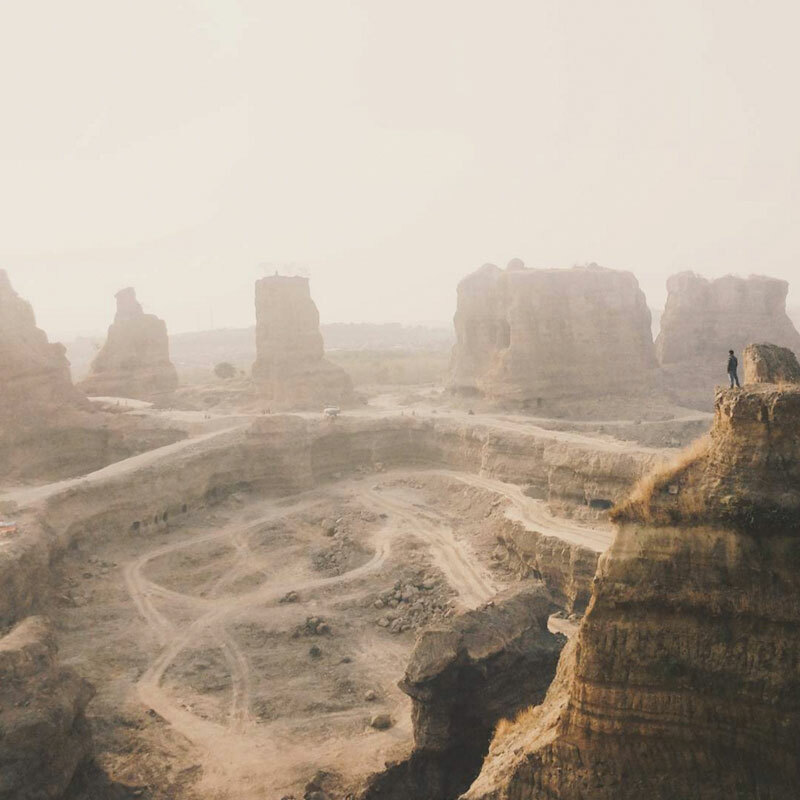 Instead of protesting against the destruction of landscape, the locals have found beauty in the remnants of quarries just outside the city. Always looking at the bright side is the typical local attitude – isn’t this a positivity that we can all learn from? 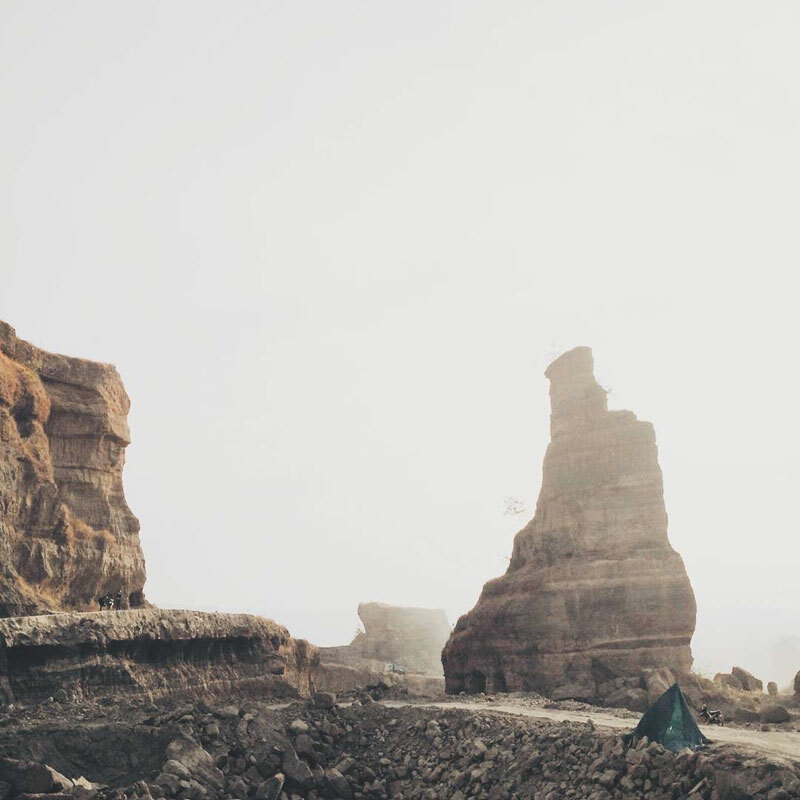 Decades of mining by explosives and heavy equipment has left its almost-natural mark, sculpting walls and pillars that tower tens of metres in height – a taste of Arizona’s Grand Canyon right here in the middle of Java. 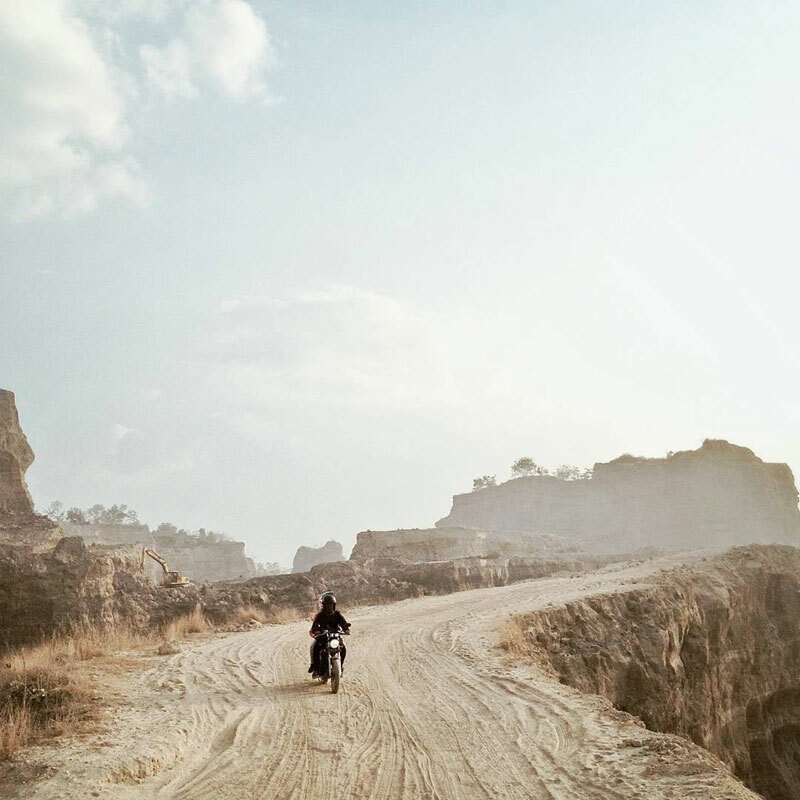 These quarries have carved out a series of trails around the site, making out ideal cycling tracks for adrenaline junkies. But be warned, there’s still trucks here during work hours so it may be a good idea to pack a piece of cloth and glasses to fend off the dust. Located half an hour into the countryside, there are practically no road signs that can direct you since Brown Canyon is not an official tourist destination. You will need a capable vehicle and a local guide to show the way if you are unable to ask for directions in Bahasa Indonesia. Address: Rowosari, Meteseh, Tembalang, Kota Semarang, Jawa Tengah 50279. Getting there: From Semarang, head east on Jl. Fatmawati towards RSUD Kota Semarang (Ketileng). Turn left towards Klipang, past Klipang Golf. Continue forward, passing by three bridges. Continue straight at the junction, and you will reach in approximately 2 kilometres. 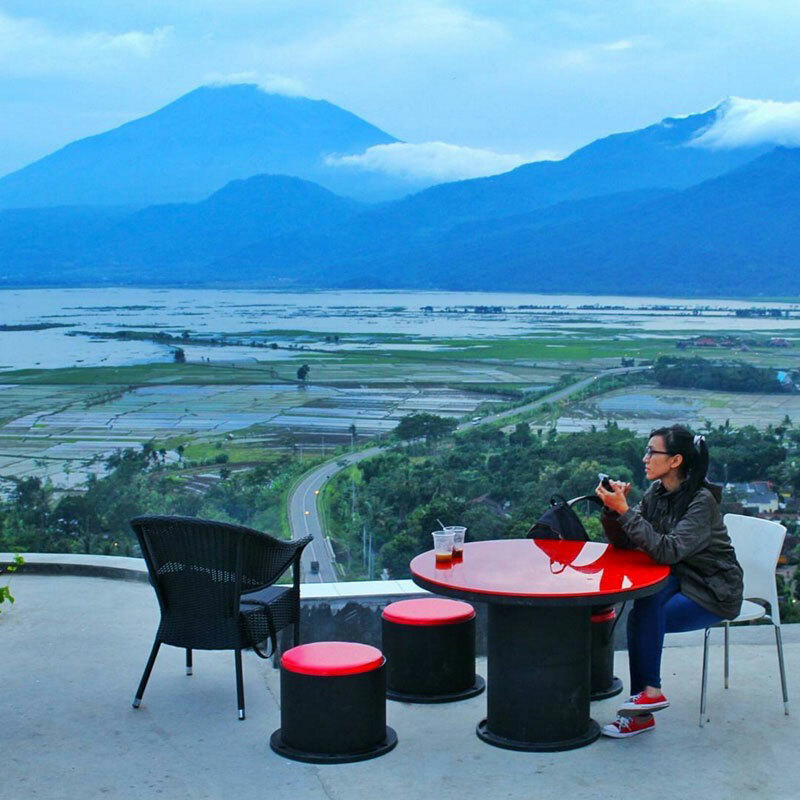 Located on the foot of Mount Ungaran, the Umbul Sidomukti was specially built to appreciate the picturesque contours of the landscape in Semarang Atas. Featuring a military grade outbound obstacle course, it is sure to challenge even the bravest souls. 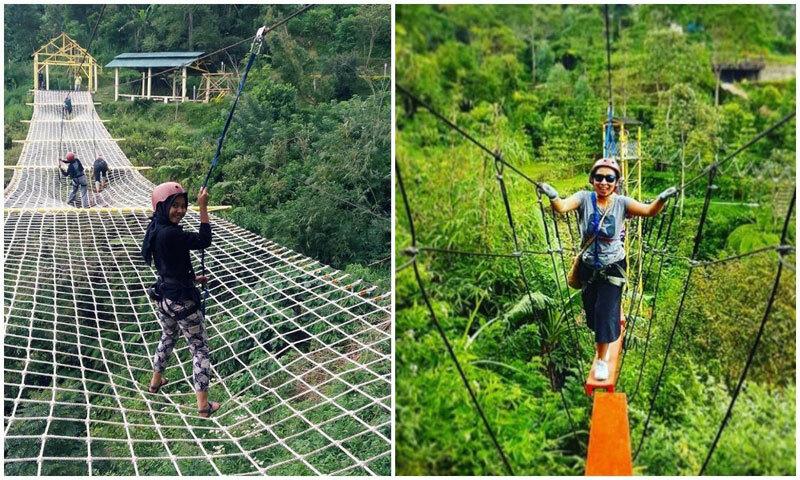 Fly across a valley over a hundred metres apart on a zipline, or crawl your way on a rope bridge hanging thirteen stories above the valley floor. If you’re looking for a more relaxing alternative to enjoy the landscape, take a dip in the spring water stone pools right across the cafeteria. Made up of ascending layers, it creates a natural viewpoint of the city below. Just can’t get enough of the mountainous landscape? The Umbul Sidomukti offers accommodation options too. Be sure to book in advance because they are usually fully booked throughout the year! 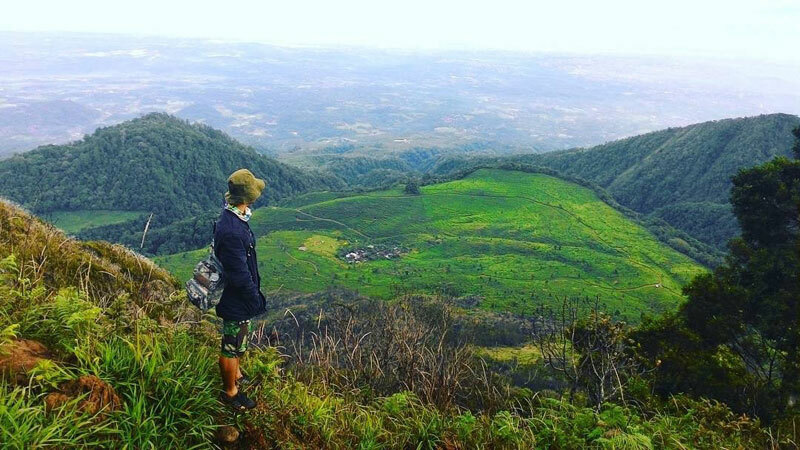 Sitting at 1700 metres above sea level, Pondok Kopi is located a little above the Umbul Sidomukti park, so you can get a better view of the mesmerizing landscape. 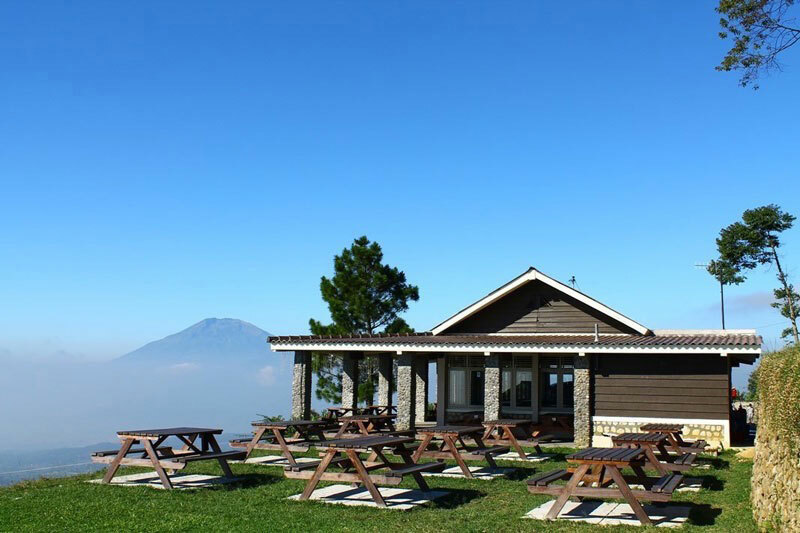 When the mist has cleared out, opt for the outdoor picnic table area for the best angle to enjoy the lush greenery. 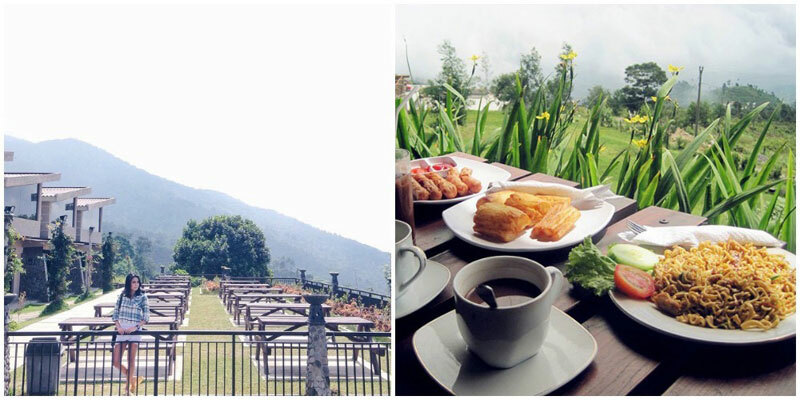 This coffeeshop up in the mountains serves more than just hot beverages. From the mandatory roti-bakar to a meal of bakmi jawa, your hunger pangs are in good hands! If seclusion is your idea of the perfect getaway, be sure not to miss the Goa Tirta Mulya nestled between the surrounding parks of the Umbul Sidomukti. 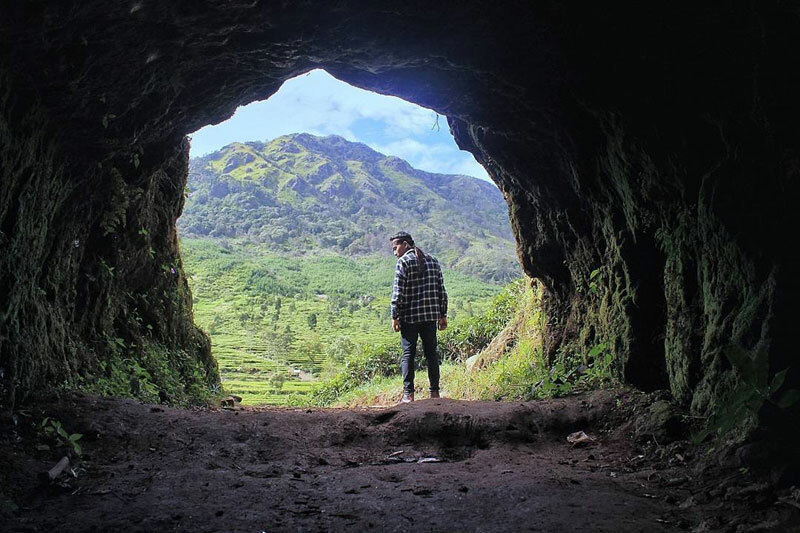 This three-metre-wide man-made tunnel snakes for a couple hundred metres into the landscape, equipped only with sparse dim lights, so you might need to use your phone as a flashlight. At the end of the tunnel is a small balcony on the face of a cliff, overlooking the hills and the city at the edge of the horizon. 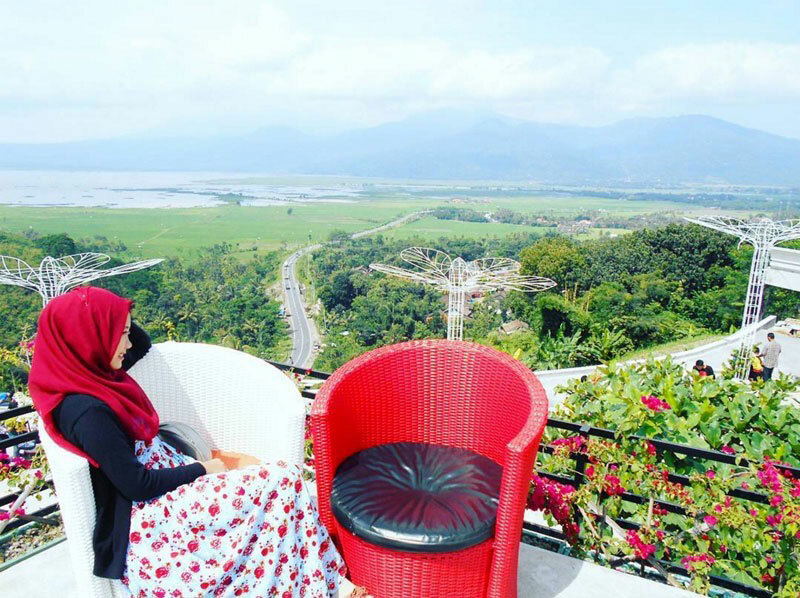 A popular backdrop for weddings, the Eling Bening is rapidly gaining a reputation as Semarang’s go-to spot for the best vantage point in the Ambarawa district. Acres of open gardens allow you to take in the surrounding atmosphere and fresh chilly mountain air as you enjoy a warm meal atop the hill. 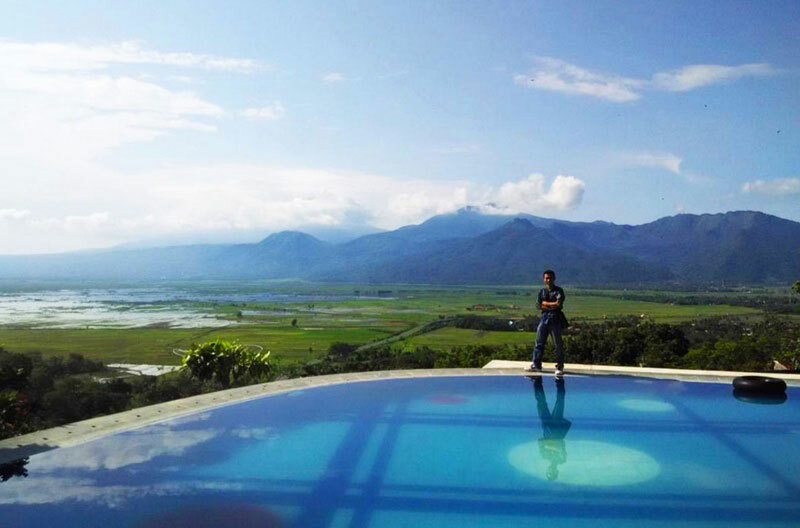 You can also enjoy a perfect view of Lake Rawa Pening below, framed by the surrounding hills with a winding road down the middle. Local cuisine is served daily in the all-white minimalist restaurant, where you can surely snap lots of elegant Instagrammable photos! 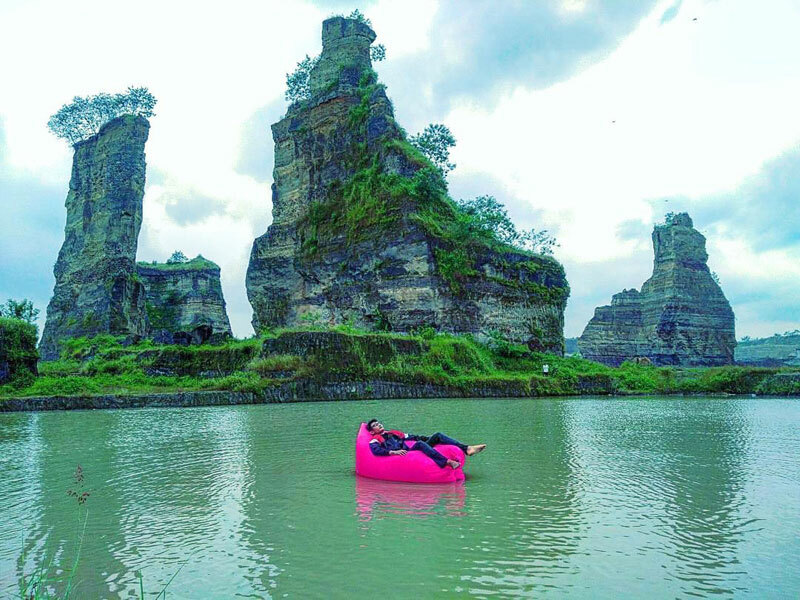 Eling Bening also embraces the concept of a family leisure park, so you are free to bring your own picnic basket and lay out a mat on the grass to really enjoy the chilly weather. Children can roam around and try out all sorts of activities from flying fox to archery, while you can sit back and relax with a warm drink. If you dare brave the cold, you can even jump into the pools for a swim! 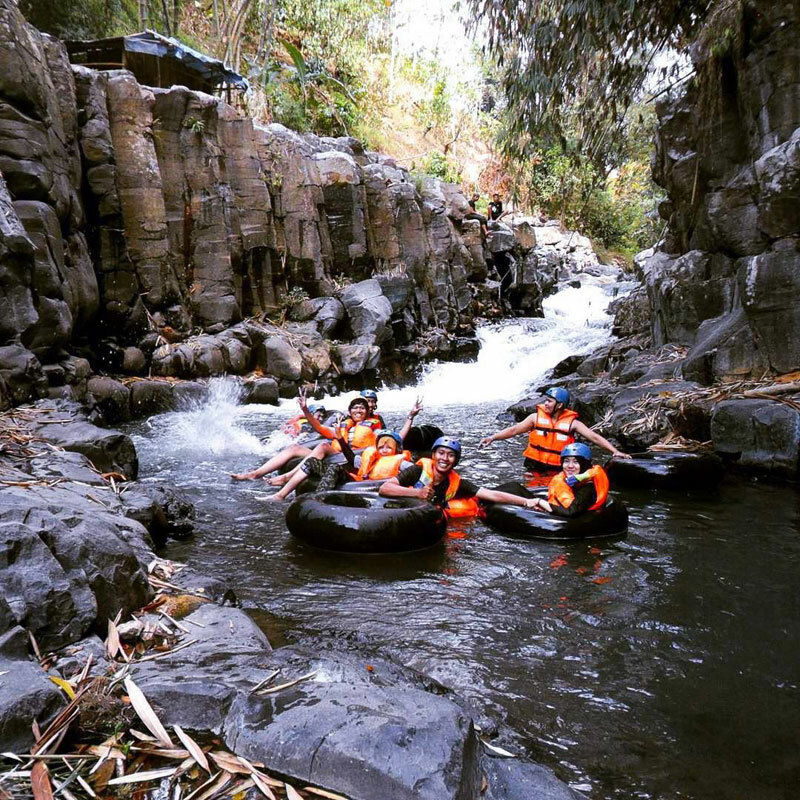 Not for the faint hearted, river tubing is as rewarding as it is dangerous, especially when you are rushing down a mountain stream braided with boulders. 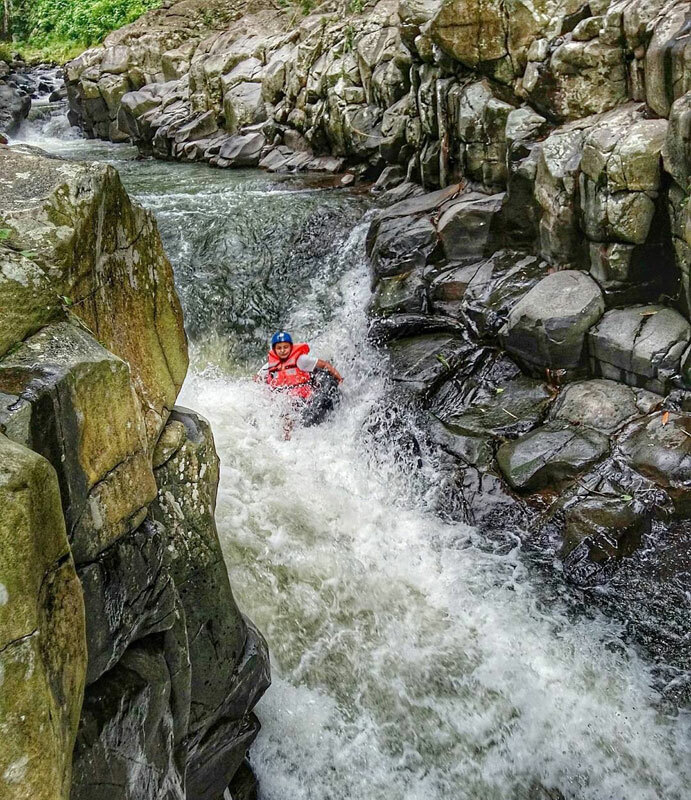 After strapping on safety equipment from the homebase, your journey starts with a 15-minute hike through the woods to reach the starting point, where a course of 13 rapids awaits you. It’s a true test of your agility and endurance to stay focused for a whole two hours! 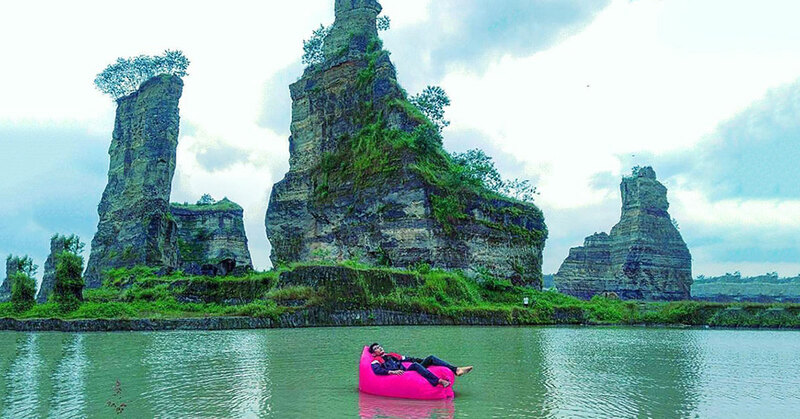 You’ll find calmer waters between the rapids, decorated with some of the most bizarre rock formations found symmetrically along both sides of the river. Neatly stacked and packed together, they almost appear man-made! It is even believed that a shaman arranged them for reasons yet unknown. After a grueling battle with the currents, cool down at a local ‘warung’ with some tea and fill up with a warm serving of cup noodles. 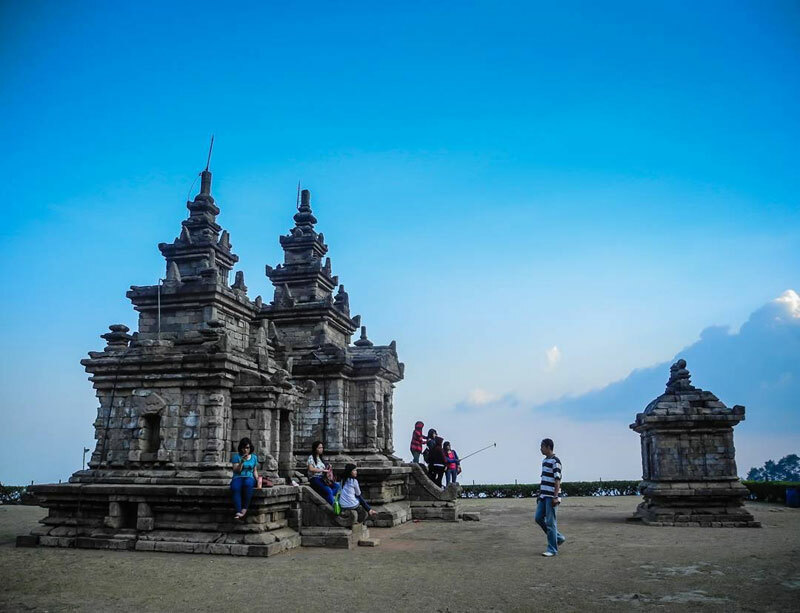 As a heritage of the Sanjaya Dynasty in the 8th Century, this temple complex discovered by Dutch colonies is scattered on the foot of Mount Ungaran. 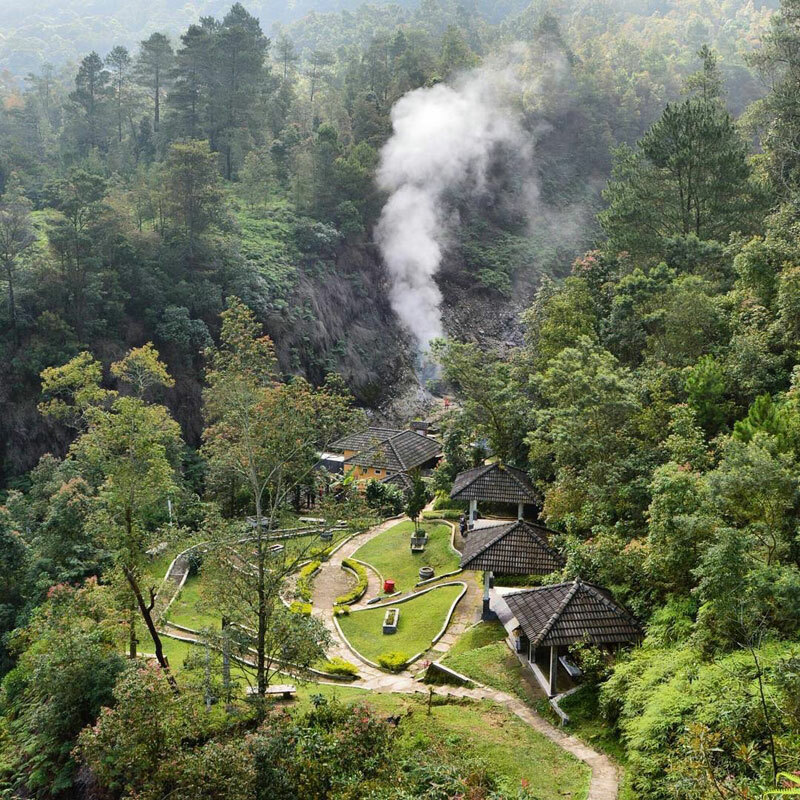 Despite its name, Gedong Songo, which translates into ‘nine buildings’, only five structures remain standing today. 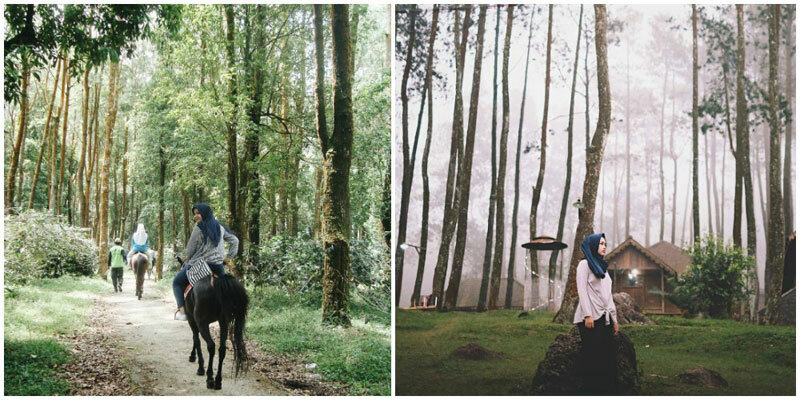 If you go for the horseback riding tour, you’ll be accompanied by a guide, who will give you a history lesson of the place and help to snap your best moments. You can even chose to ride on your own if you are an experienced rider! Galloping through pine forests between temples will make you feel like you’re on the set of Game of Thrones, especially with the added effect of the occasional fog in the mountains. After exploring, unwind and ease those sore muscles by taking a quick dip in the natural hot spring. Ladies take note – it’s widely believed to have beautifying properties too! Alternatively, grab some snacks at the cafeteria and enjoy a picnic in the open fields where pilgrims have once gathered. 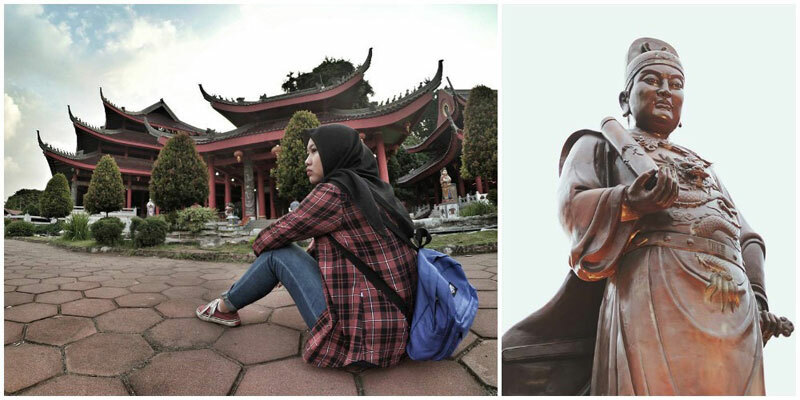 Semarang embraces diversity in harmony. 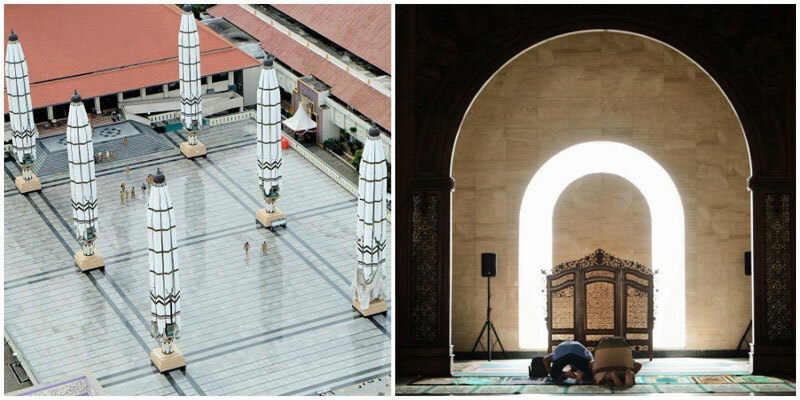 This can be seen through the different elements that compose the Grand Mosque of Central Java. On the front are 25 pillars assembled in a style that resembles a blend of Italian Renaissance and Arabic calligraphy. 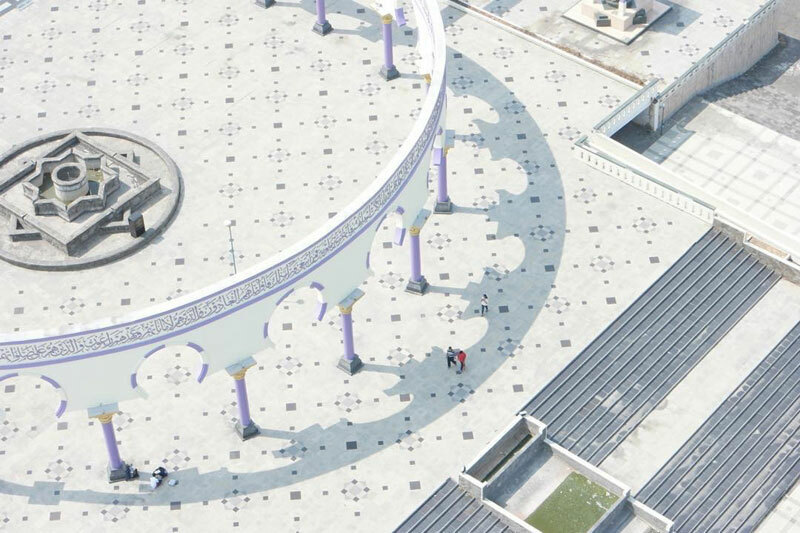 The Arabic influence can be seen in the courtyard where six gigantic umbrellas stand, which are identical to the ones in Masjid an-Nabawi in Medinah. The mosque building itself is a fusion of Javanese and traditional Arabic mosque architecture, while the interior is a tribute to Javanese style mosques, which is evident in the furniture and materials used. 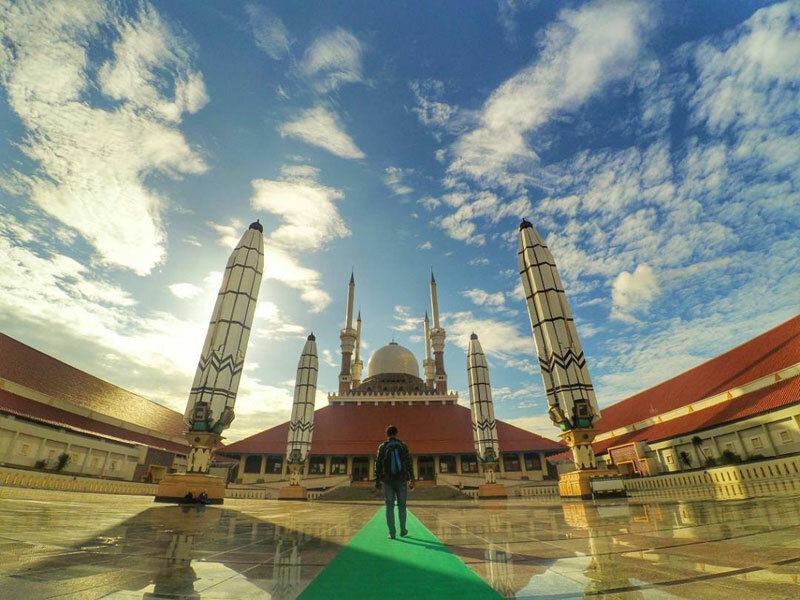 More than just a place of worship, the Masjid Agung complex is also home to the Asma al-Husna Tower. Its first two floors feature a museum illustrating the history of Islam and how it had spread in Java. 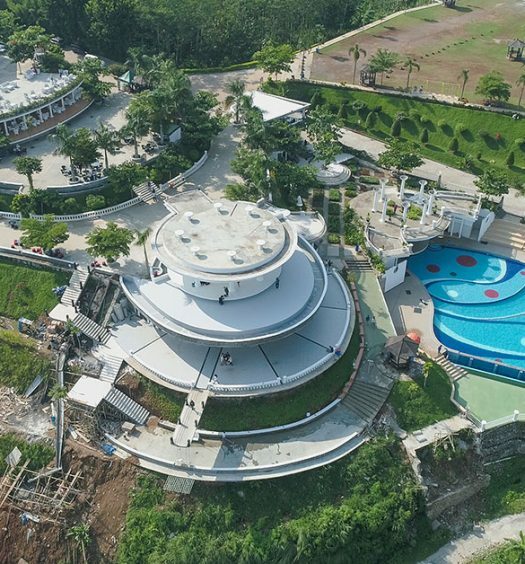 If you take the elevator to the top floor, you can get a panoramic bird’s eye view of Semarang, which stretches from the Java Sea to the mountains towards Semarang Atas! Don’t let its reputation for being one of the most haunted places in Indonesia keep you away from one of the city’s most majestic icons. 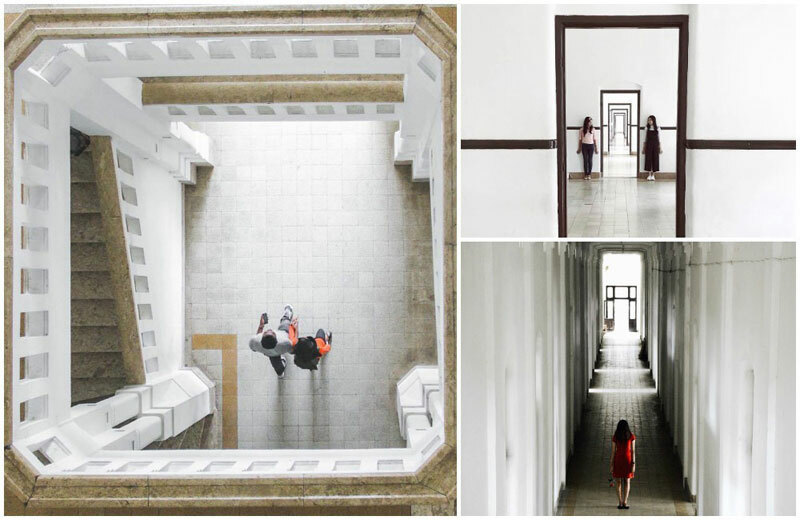 Lawang Sewu is a must-visit if you are in Semarang. Step inside the courtyard and you will be transported a hundred years into the past. With so many picture-perfect angles to snap from, the only hauntings you will see during the day are tourists with selfie-sticks! 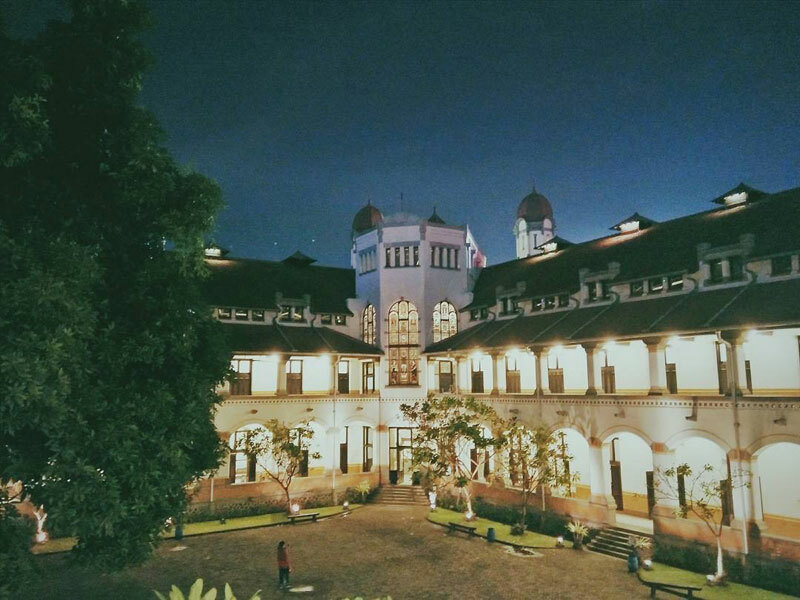 Built as headquarters for the Dutch East Indies Railway Company, the name Lawang Sewu translates to ‘a thousand doors’, as its design consists of many doors and windows. During the Japanese occupation in WWII, the building was declared as a Japanese base and the basement was used as a prison. 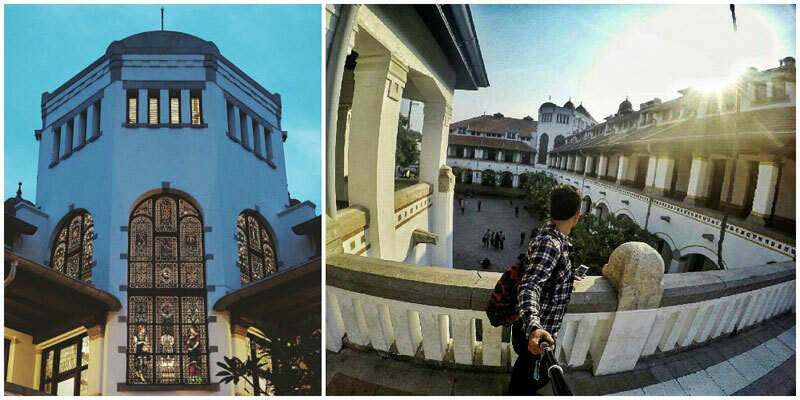 Lawang Sewu is now a museum operated by the national railway company, exhibiting artifacts that showcase the progress made by Indonesia’s railway throughout the years. The main idea on a culinary tour is to try as much food as many as your guts can take. What better place to do so than at a street food market? 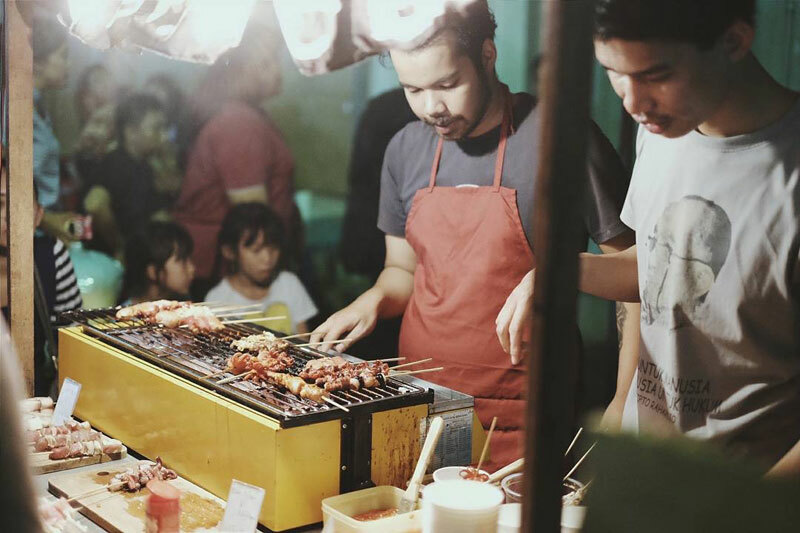 Starting on Friday nights, the back alleys of the Pecinan district are closed from 6pm to 10 pm during the weekend to make way for this street food block party. 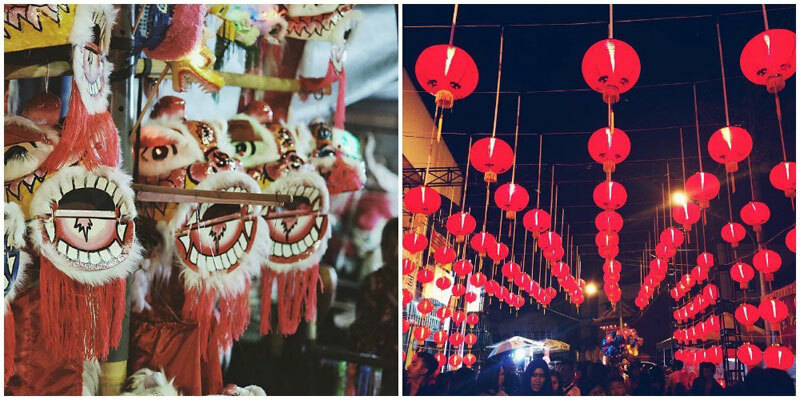 Originating from Lunar New Year night markets, Pasar Semawis has been a weekly event in Semarang since 2004. 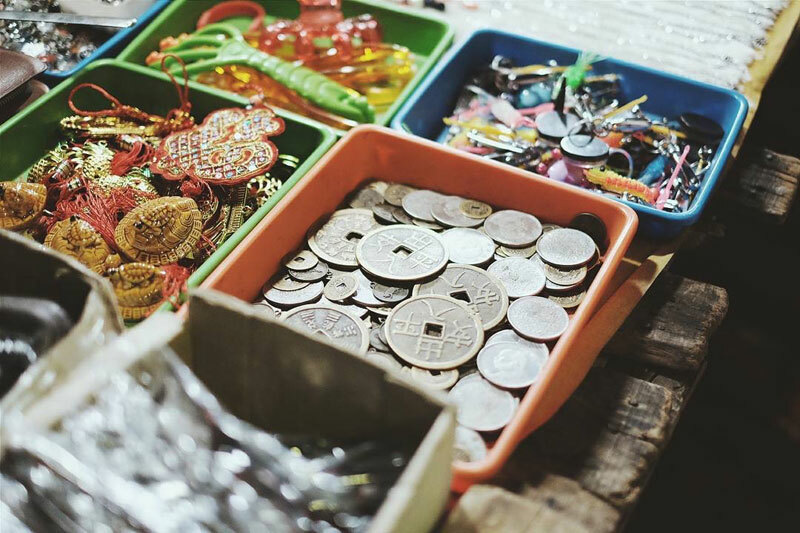 From traditional Chinese delicacies to modern-infused local dishes, Pasar Semawis is paradise for food lovers. Treats range from boiled bananas to steamboat feasts! Just like any night market, you can never really predict what you will find. Expect to see toymakers, traditional jewellery vendors and street artists as you stroll along! Do you agree that separating meat from bone is too much of an effort when eating fish? Well, someone had already come up with a solution to enable you to enjoy fish without fussing over tiny bones! In 1977, Hanna Budimulya discovered that by pressure cooking the Bandeng fish, which is notorious for its abundance of small sharp bones, the bones become soft and edible. 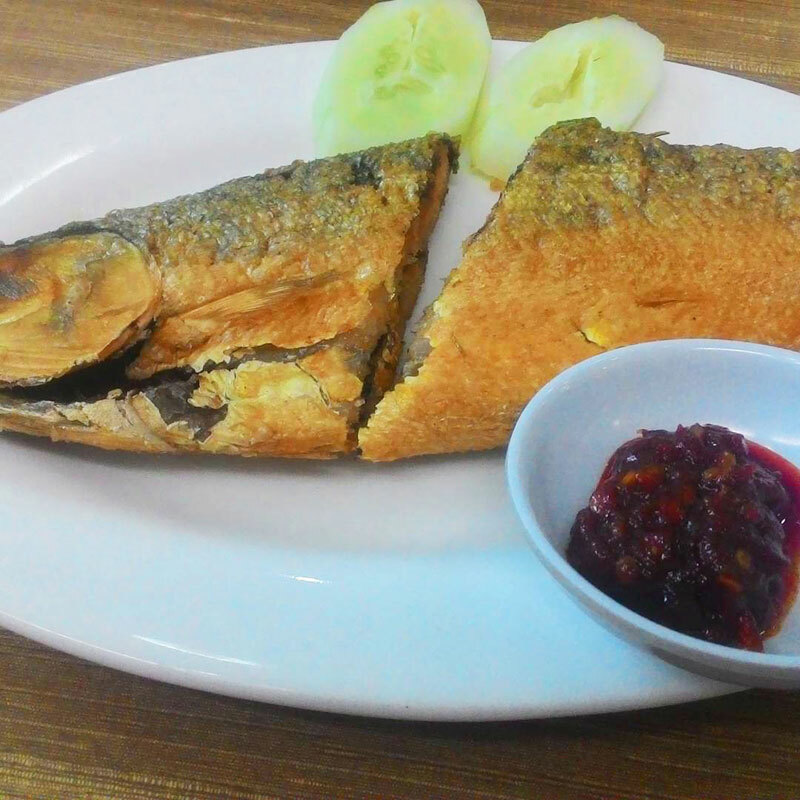 This quickly became Semarang’s signature dish! Wrapped in banana leaves, the simple combination of garlic, turmeric and salt on Bandeng leaves a savory sensation on your tastebuds. Pair it with sweet and spicy sambal and you have the perfect combination! Although many restaurants have started producing this dish, if you want to get the original taste, head over to Pandanaran Street for Hanna Budimulya’s original recipe at Bandeng Presto. A popular brand for a packaged version that you can bring home is Bandeng Juwana found in almost every souvenir shop in Semarang. 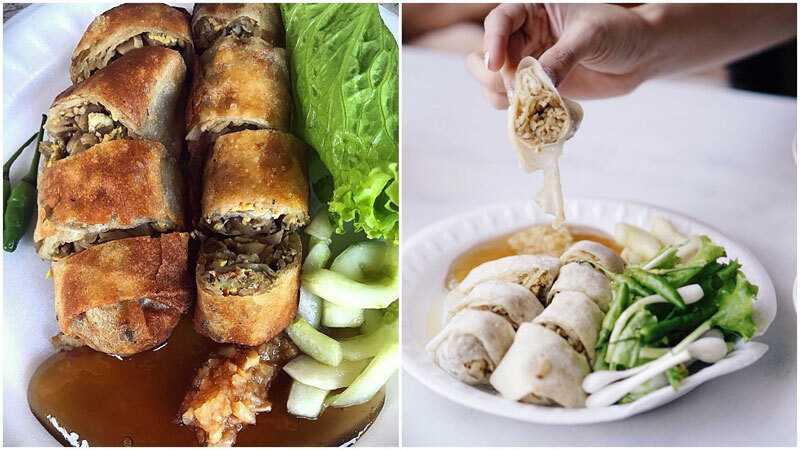 Brought into Semarang by early Chinese traders, Semarang’s lumpia (also known as spring rolls) has undergone generations of adaptation before arriving at its unique taste today. Bamboo shoots, chicken and shrimps are rolled up, and are either fried (for a crispier taste) or not (for a tender taste). As with any other Indonesian dish, it is served with its own sweet and spicy sauce that simply melts in your mouth! You can find this dish in numerous restaurants here, some with their own variations such as the Vietnamese-style Lumpia Basah. 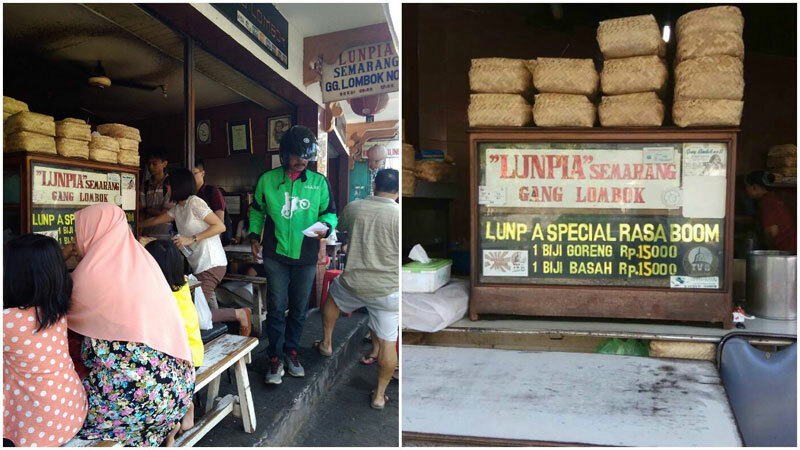 One popular restaurant is the Lumpia Gang Lombok near the Pecinan district. 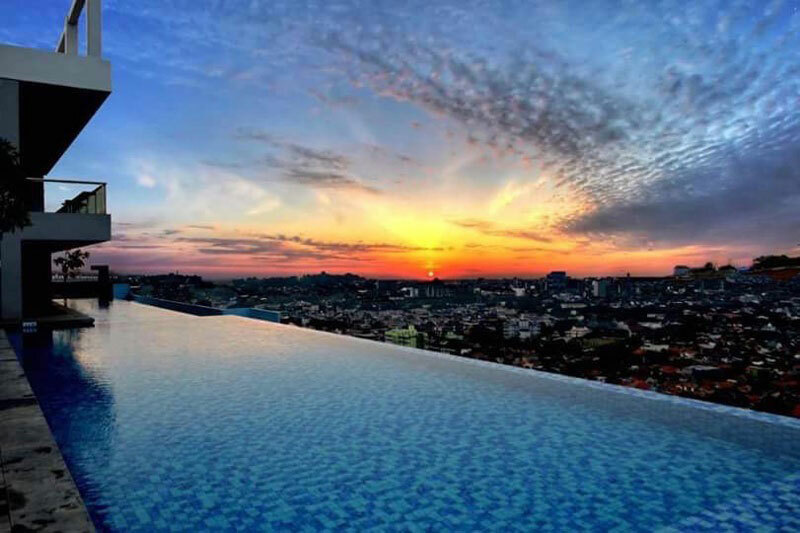 Renowned as the highest swimming pool in Indonesia, the Star Hotel (formerly known as the Best Western Semarang) allows guests to view the cityscape from the pool’s edge on the tallest skyscraper in Semarang. Taking a dip in the infinity pool isn’t the only way you can enjoy the view. The Sky Pool Bar offers refreshments, including a collection of wine for you to savour while lounging on the deckchairs by the rooftop pool. You can enjoy barbecue party on Fridays and Saturdays from late afternoon onwards. Besides the grill, the hotel also offers a buffet with various local and international dishes, as well as an open bar right by the pool! Located in the city, the Star Hotel provides great accessibility to all the hotspots in Semarang and is walking distance from the Java Supermall. 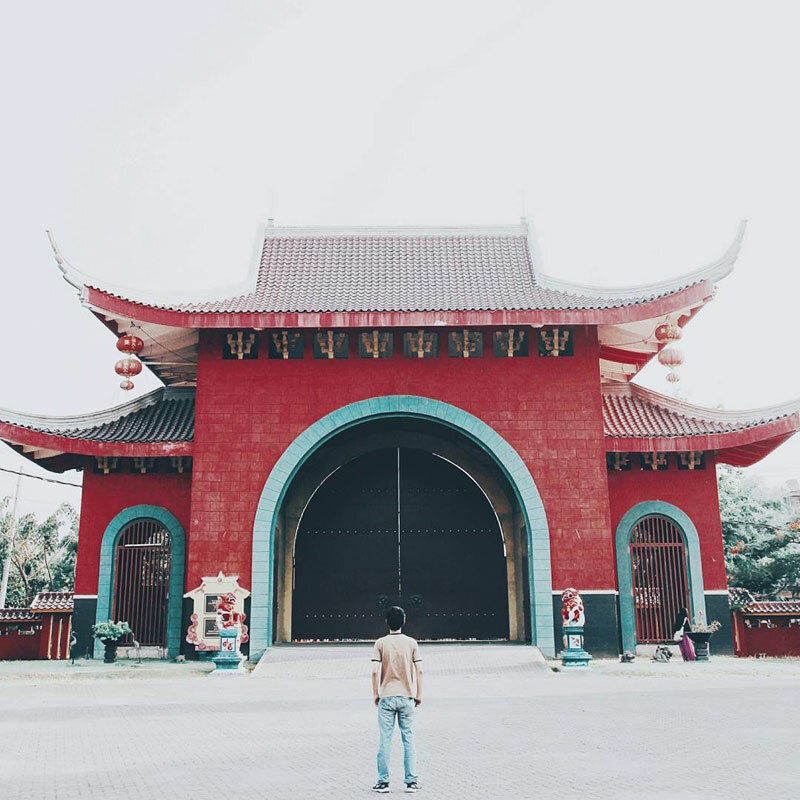 The Sam Poo Kong Temple was built to commemorate Chinese Admiral Zheng He’s visit to Semarang in the 15th Century, strengthening the cultural influence of the Chinese Empire in Java. As a Chinese Muslim voyager, Admiral Zheng He was sent on a trade and diplomatic mission to several countries in Asia, including those in Southeast Asia. His visits were celebrated by the locals as the expedition brought exotic goods as well as an exchange of people and culture. 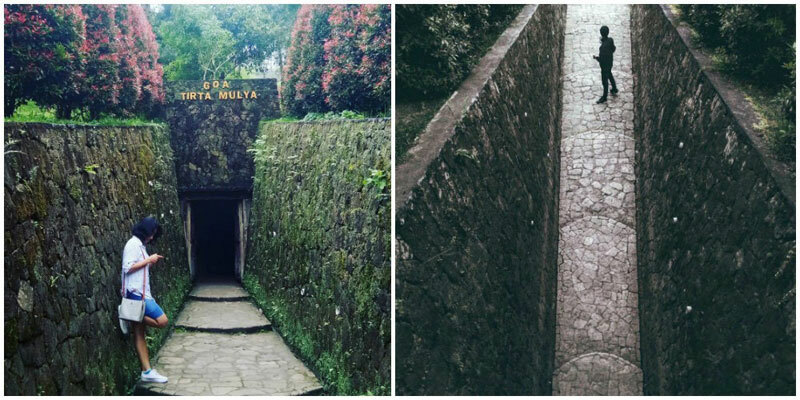 Originally a cave where Zheng He’s men would take shelter in, the place was subsequently used as a temple for meditation by the men who stayed back in Semarang for the development and construction of the city. The temple compound is also home to their tombs, and stone reliefs hang on the walls of the entrance, illustrating their visits to Indonesia. An annual ritual of Sam Poo Kong Temple takes place at the end of the 6th Lunar month, where statues are paraded through the streets from Jalan Lombok, Semarang’s Chinatown, to the temple for blessings for the year. 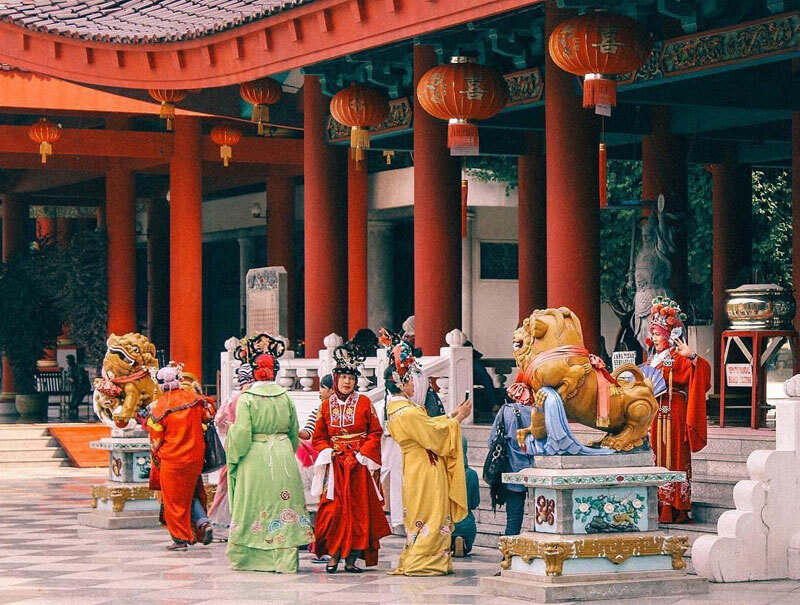 For an authentic feel of the Chinese culture, visitors can rent traditional outfits to take photos in, which complement the backdrop of the red temple. The package includes a photographer as well as printing, and is available from 9am to 5pm, with an additional charge of IDR 80,000 (USD 6) per person. 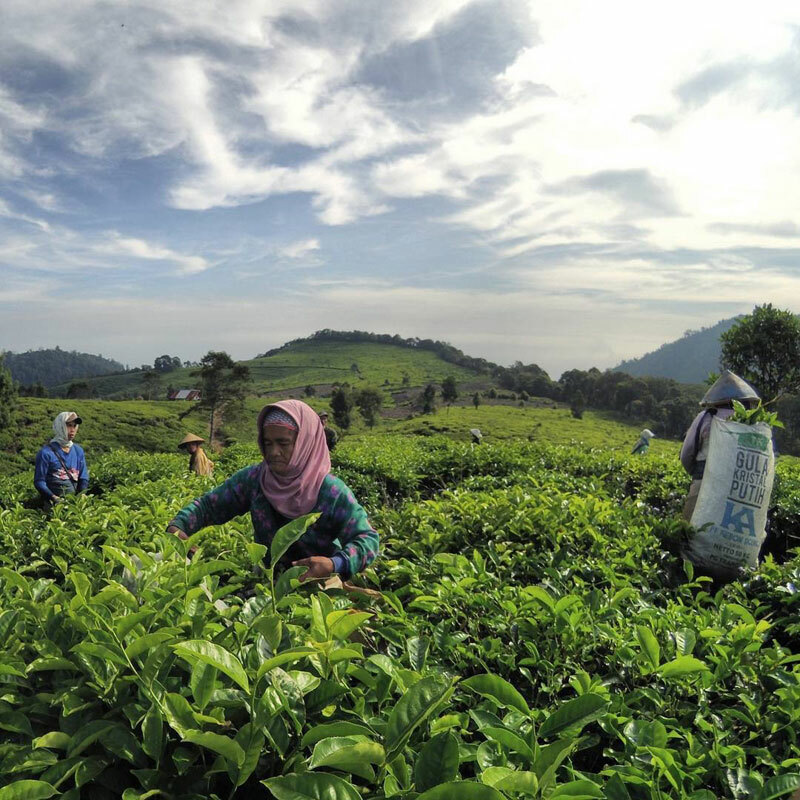 The hilly terrain and cool temperatures in the south of Semarang are perfect conditions for tea plantations to thrive. And since the early 1900s’, travellers have loved the vibrant greenery in the area. The long and arduous journey to get here means you can enjoy the scenery without crossing paths with too many tourists. 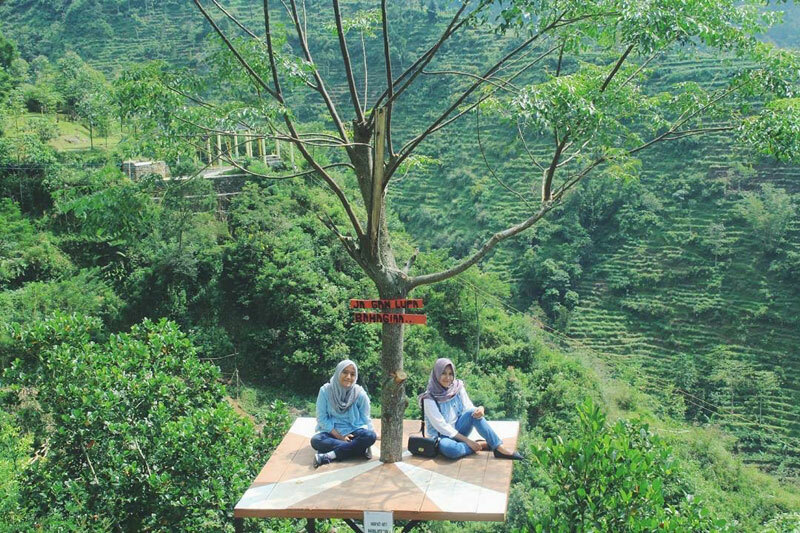 At 1000 metres above the sea, the distinctive atmosphere is the main reason to visit the Medini Tea Gardens. Get a real feel of isolation as you sip a cup of freshly brewed tea from the hilltop, while gazing down at the vast plantations. Isn’t it such a stimulation for your tired eyes as you absorb every little detail of the neatly trimmed shrubs packed uniformly across the hills and plateaus? 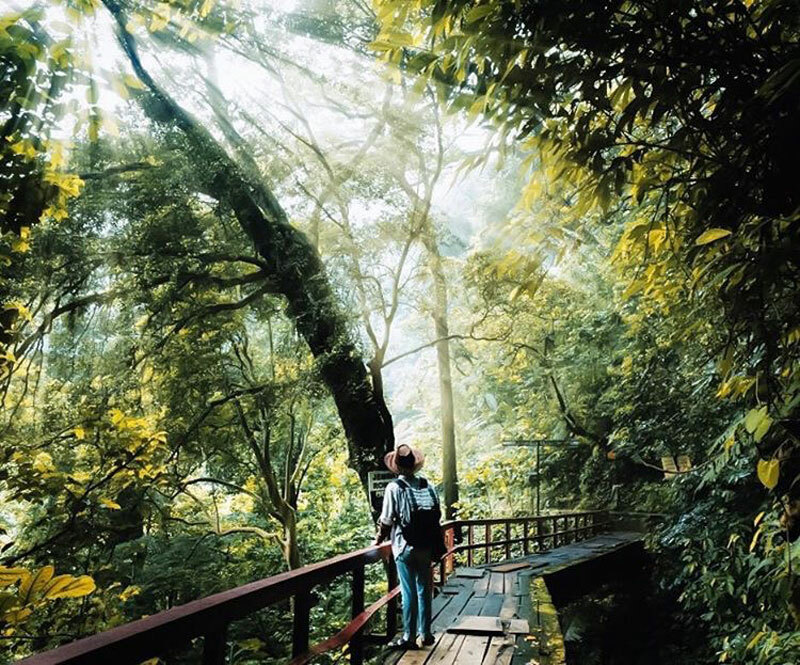 Often used as a campground for hikers heading up Mount Ungaran, Medini Tea Gardens offers other sights too, such as the Goa Jepang – a place where Japanese troops took shelter during their WWII invasion. Also, don’t miss the Promasan Temple, which features a royal bath house built on a natural hot spring! Address: Kebun Teh Medini, Limbangan, Jatirejo, Ngampel, Kabupaten Kendal, Jawa Tengah 51357. Getting there: From Pasar Jerakah, head South to Boja, passing by Mijen and Cangkiran. Once you get to Boja, turn left towards Tamanredjo Regency. From there, the road gets rough, so make sure your vehicle has ground clearance and is in good condition. If the sound of adventure turns you on, look no further than these majestic waterfalls. 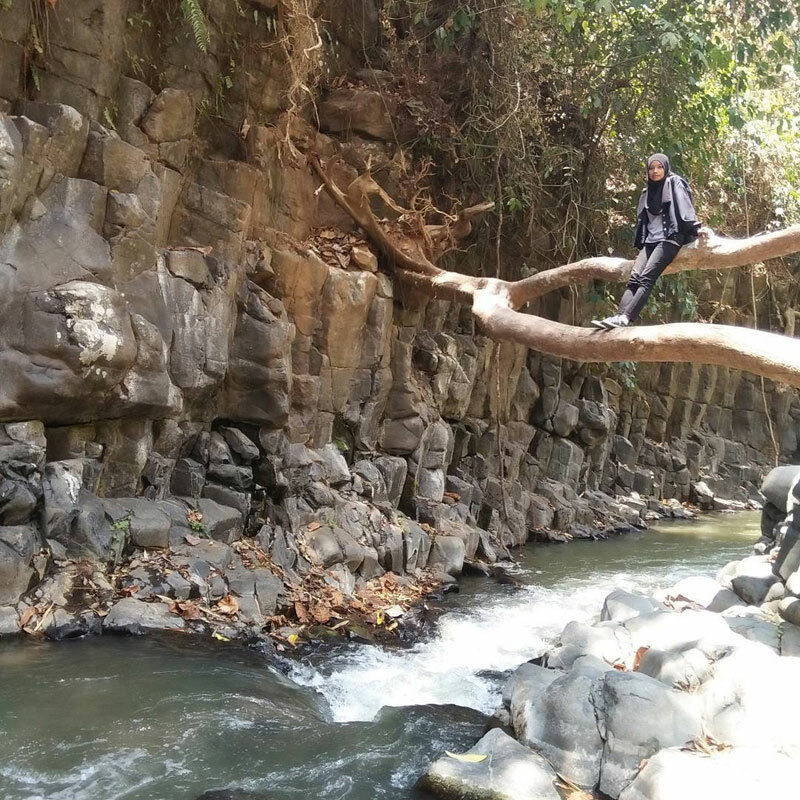 Reserved for the most courageous at heart, the trail to two of the grandest waterfalls in Semarang requires vigilance and agility. 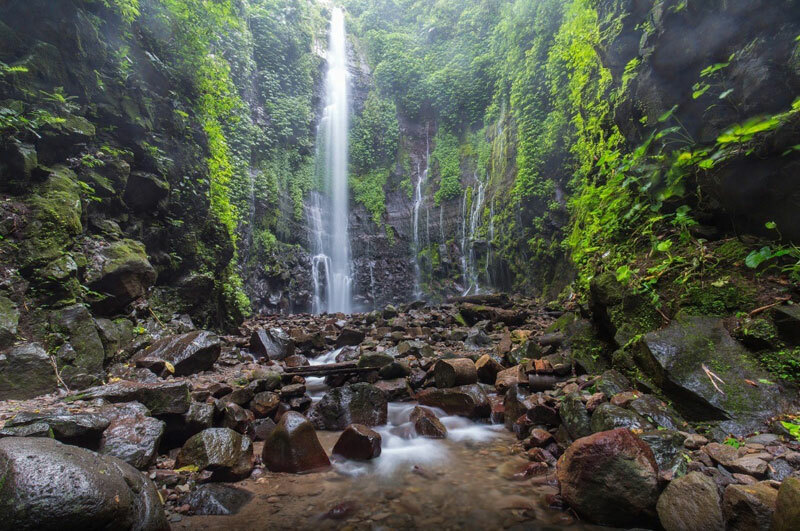 Located on the western face of Mount Ungaran, the two waterfalls are of great significance to the locals. Besides having supplied water for centuries, it’s a place of unimaginable tranquility for a retreat. The tougher the journey, the sweeter the reward. Do come with a good pair of shoes, as the path is moss-laden and slippery! 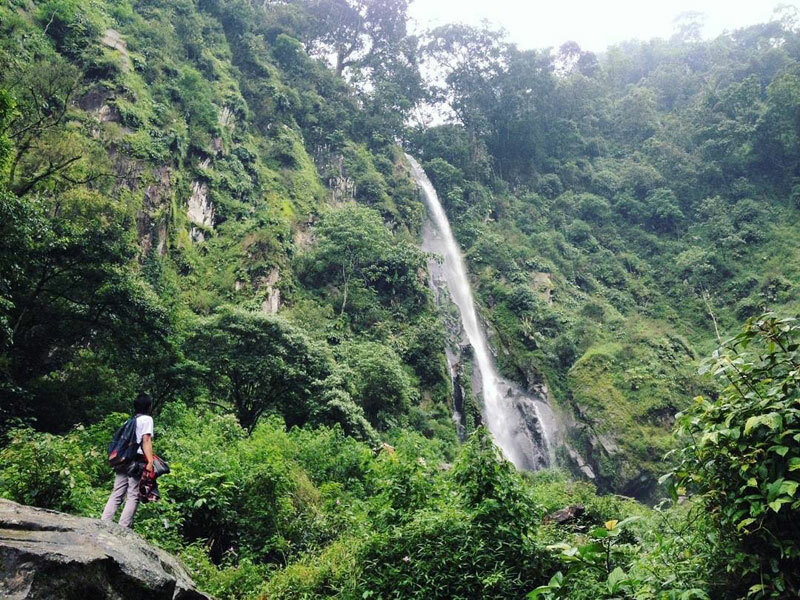 Curug Lawe is located on a concave face of a cliff, showering visitors with 25 waterfalls gushing out as high as forty metres from the ground. The surround sound is completely hypnotizing! 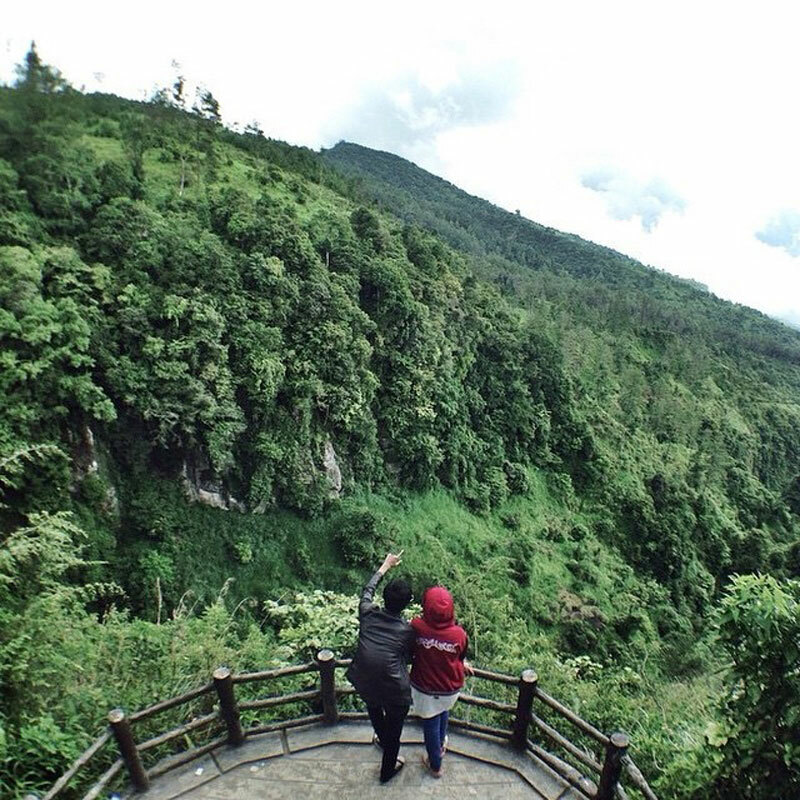 Curug Benowo is a series of cascading waterfalls several storeys in height. With each level, the burst of water decreases, so you can safely dip into as many pools as you like! Address: Langgar, Ungaran, Ungaran Barat, Gonoharjo, Limbangan, Semarang, Jawa Tengah 51383. Getting there: From Pasar Jerakah, head towards Boja. After you pass the Mijen regency, turn left onto Jl. Raya Cankiran-Gunungpati. Continue straight on the road, you will arrive in about half an hour from there. Note: This is located near the Medini Tea Gardens, so you can travel to these two attractions together! 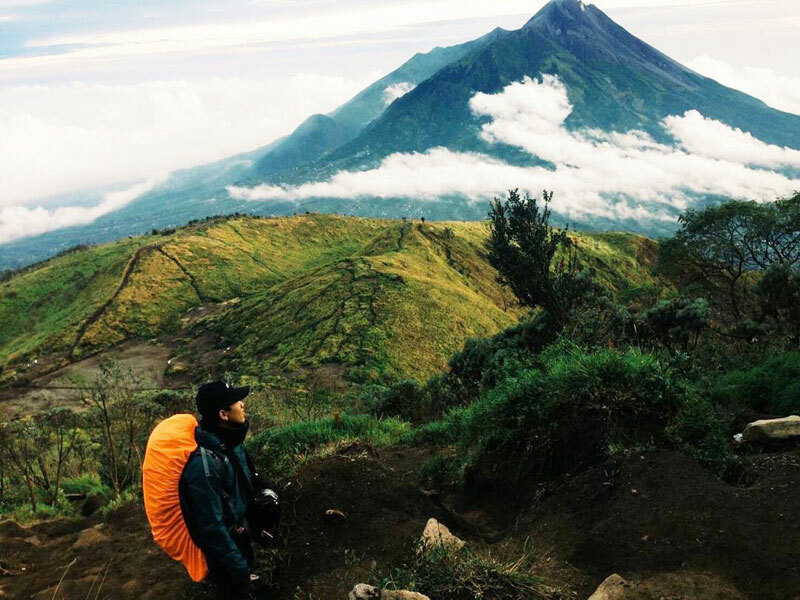 Offering a spectacular view every step of the way, it is no surprise that hundreds of hikers flock to Mount Merbabu every weekend, despite knowing that they have to endure up to nine hours of grueling trek on the mountain trail. 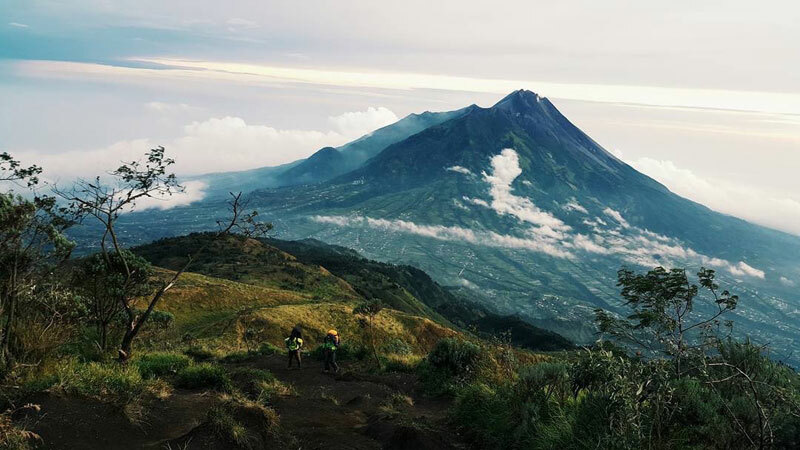 Standing over 3000 metres above the sea, Mount Merbabu is located right next to Mount Merapi, painting the landscape with the picturesque ‘twin peaks’ many of us are familiar with. There are several trails you can take on this epic hike. 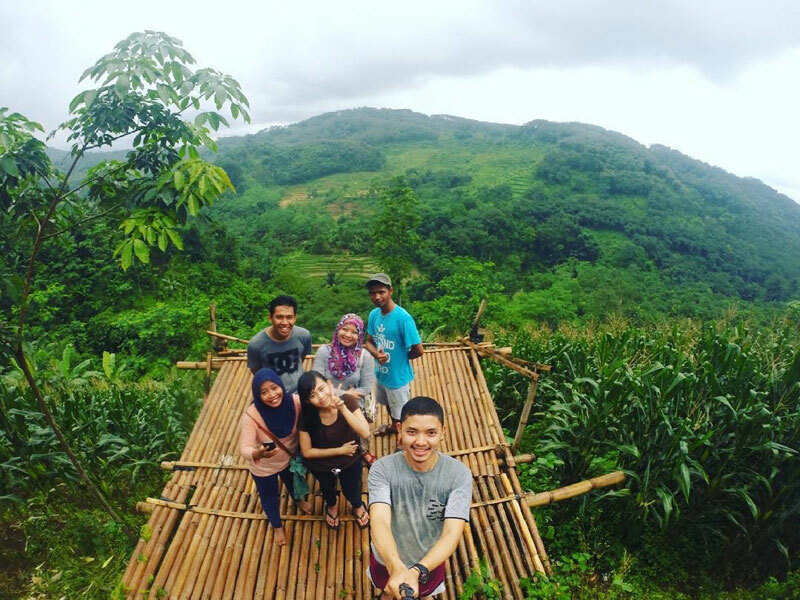 Selo trail from Boyolali is the least demanding and has the best sights, but has no water stops along the way. While the Wekas trail is the fastest, the Cuntel trail greets you with ‘Bukit Harapan’ where a really neat-looking dead tree stands. For first timers, it is essential to get a guide for your trip. 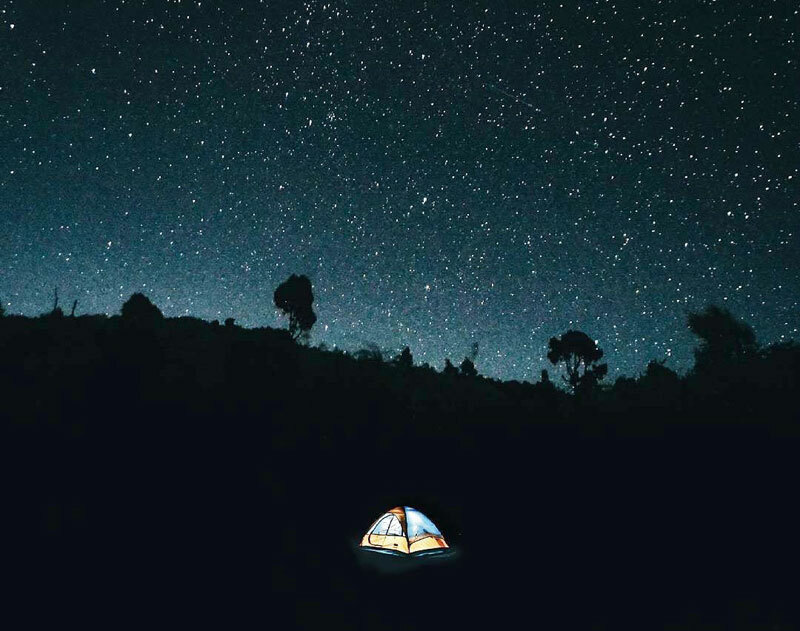 There are seven summits to chose from and even more selections for camping grounds. 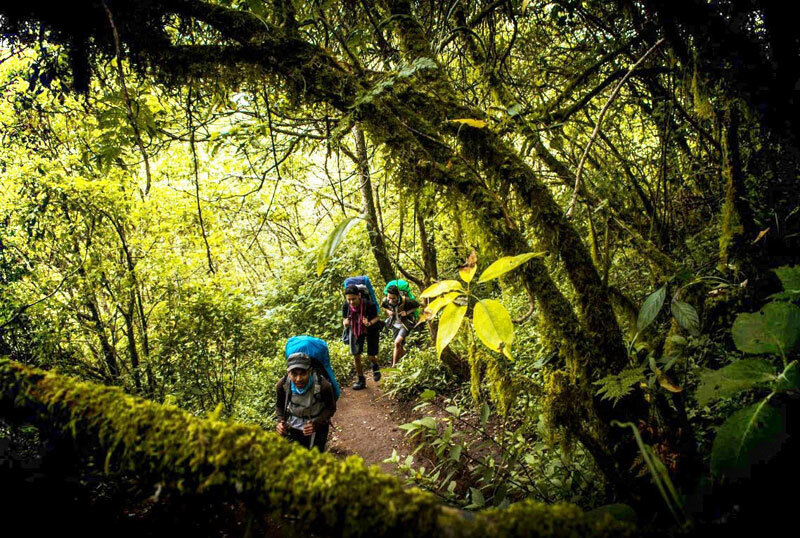 Besides helping you to carry your stuff, guides will inform you of the best spots that day, since weather, fatigue, and ground conditions are serious factors to consider. Guides are easily found around the entrance office and will charge a reasonable amount for their services. As you emerge from the dense jungle in the early leg of the trail, you will be instantly granted a majestic view to motivate your tired legs – endless waves of vast greenery decorated with exotic highland flora. At night, the show is taken to the skies, where the shimmering constellations make you feel closer to heaven. Witness the break of dawn, as the violet horizon is absorbed slowly by the gleaming rays of the sun. 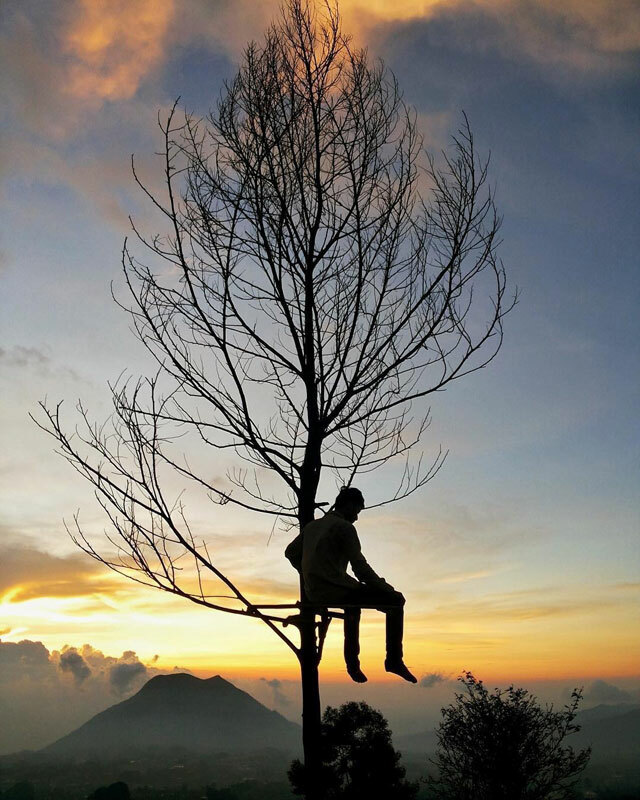 And you will be awed by the majestic sight of this sunrise atop Mount Merbabu. In the distance, besides the neighbouring Merapi, you can also see 6 other highest peaks of Central Java including Sindoro, Sumbing and Slamet. It’s truly a sight worth hiking for! Getting there: Besides being the least difficult trail, hiking from Selo offers the best sights. Take the Semarang-Solo bus and stop at Pasar Sapi, Boyolali. Then, take a minibus to Cepogo, and continue with another minibus to Pasar Selo. It’s an hour’s walk to Selo Base Camp, so you might want to take an ojek ride there. From the base camp, the peak is about a 6-hour hike with three major posts. Be sure to pack extra water since it’s scarce on the trail. 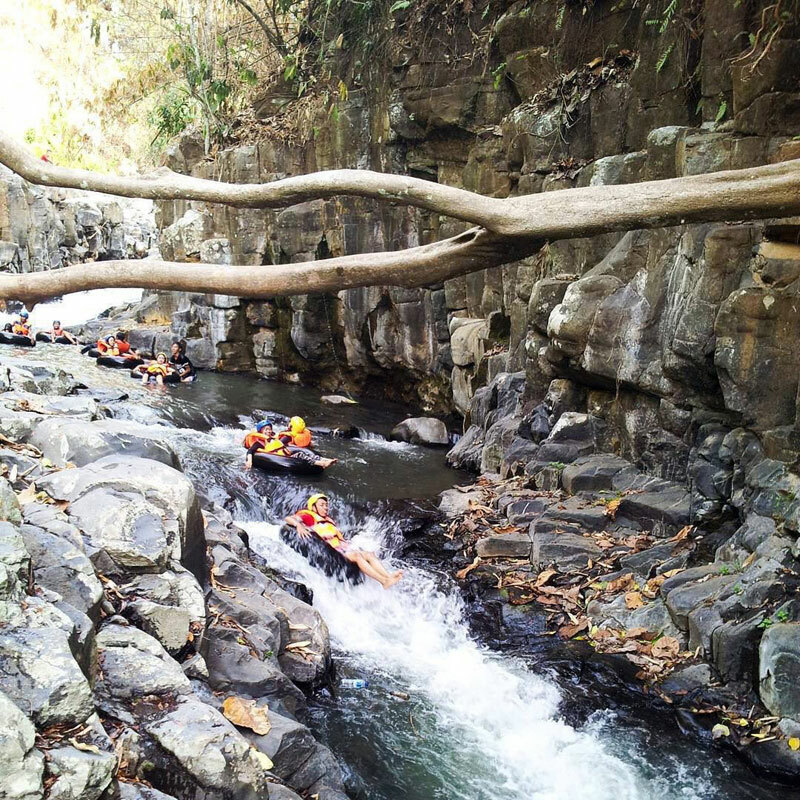 Have we inspired you to take an off-the-beaten route to enjoy the hidden wonders of Semarang? If you know of any other exciting hidden gems, we would love to hear from you!